Get a More Restful Sleep - While heat increases the body’s external temperature, the cooling off period afterwards induces natural relaxation. 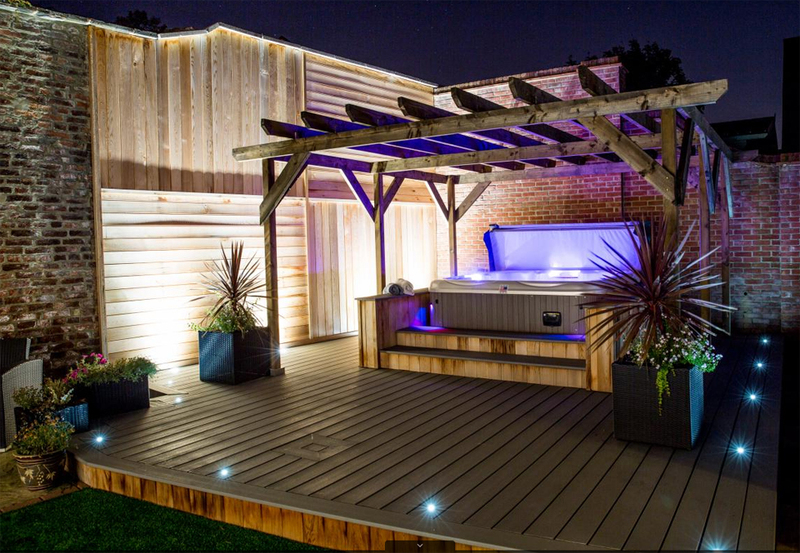 Unlike the use of medications and prescription sleep aids, the circulation and warmth of a Spa/Hot Tub encourages the body to unwind and relax on its own, leading to a more restful sleep. Arthritic Pain / Fibromyalgia - Your Spa/Hot Tub is quite literally your own personal mechanical masseuse, at your beck and call whenever you need it. The added benefits of heat for better blood flow and buoyancy to relieve the strain of gravity on your frame make the spa an ideal treatment for both arthritis and fibromyalgia. Regular hydrotherapy can help to relieve the symptoms of arthritis. The heat from the water relaxes the body and increases blood flow, while the powerful massage jets loosen muscle tension and soothe sore joints. Being submerged in water removes up to 90% of your body’s weight, making you feel lighter and more buoyant. Type 2 Diabetes - A recent study in the New England Journal of Medicine shows that sufferers of type 2 diabetes can benefit from regular use of a spa. Many diabetics are unable to endure rigorous activity and have difficulty with weight and circulation, however the study revealed that sufferers experienced a significant decrease in blood sugar levels and improved sleep after spending just 30 minutes a day in a spa. For those who live with the daily discomfort and inconvenience of diabetes, a Spa/Hot Tub can be the answer to a fuller, more enjoyable life. Hydro-Massage is a Great Stress Relief - There are many reasons why a spa is so successful at relieving stress and helping you to unwind during tense times. Hydrotherapy, combined with heat therapy and the buoyancy of being submerged in water, all work together to allow your body to release tension, loosen stiff muscles and encourage the blood to flow more freely. Do you suffer from stress headaches? Effective hydrotherapy increases blood circulation, which can relieve tension headaches caused by stress. Massage jets, such as the ones in our Spas / Hot Tubs, can directly soothe tightness in stress-prone areas like the neck, shoulders and lower back. The massage jets in our Spas are precisely placed to massage major pressure points for the ultimate in massage therapy. Let the powerful massage soothe your aching muscles and relieve your stress. Throughout history, humankind has sought relief from the working day through relaxation and fellowship. For centuries, one of the most refreshing and healthy ways of combining the two has traditionally been through the utilisation of a spa. From ancient communal baths to modern jetted hot tubs, the healing power of water has been harnessed to relieve stress and provide a setting for relaxed interaction and renewal. You can be assured that the moments of relaxation you spend in your Spa will be matched by the knowledge that you purchased the finest home hydrotherapy product of it’s kind available on the market. Hydrotherapy is an age-old form of healing and stress relief. Hydrotherapy is based on three simple principles: heat, buoyancy and water movement, or hydro-massage. Heat dilates the blood vessels and increases circulation in the body, thus speeding up the removal of metabolic waste. Heat also helps endorphin’s (the body’s natural pain relievers) to work more rapidly so that areas of the body such as muscles and joints that have been strained, injured or stressed are relieved more quickly. Since the body weighs 90% less when suspended in water, the effect of buoyancy on the body is a simple physics issue. When specific gravity is reduced, pressure on the spine, muscle groups, ligaments and joints is significantly eased. Hydro-massage, the delivery of moving water to various parts of the body, is the final and critical ingredient to the hydrotherapy process. Stress, injury and poor posture can cause muscle spasms and pain in muscles, and as a result, all body systems can benefit from hydro-massage. Specifically directed jets of water stimulate and relax trigger points – highly sensitive hot tub relaxation ”nodules” in the spasming muscle. Massage has also been shown to improve flexibility, increase circulation and provide restorative benefits. Hydrotherapy is more than just a way of relieving stress and stress-related conditions such as high blood pressure, headaches and chronic pain. Every part of the body can benefit, including the skeletal, respiratory, circulatory, muscular and digestive systems. Hydrotherapy has been proven to be especially effective in reducing the pain of arthritis, tendonitis, bursitis and inflammation resulting from sports injuries and overexertion. The moist heat is extremely beneficial to those suffering from respiratory ailments such as congestion, chronic bronchitis and asthma. Increased circulation derived from hydro-massage improves digestive processes; waste and metabolic by-products are more easily eliminated, and lymph is moved more efficiently through the body, strengthening the immune system. With hydrotherapy, it isn’t simply the case that you feel relaxed while in the spa for those precious few minutes; in fact you have an experience that will have far-reaching effects on the quality of your life. Rarely do health and pleasure come together like they do in a Spa/Hot Tub. While many may think of hydrotherapy tubs as a luxury item, reserved for those who have the means to enjoy the fine life, for others a hydrotherapy tub is an indispensable part of making it through the day. The scientifically proven benefits associated with regular therapeutic hot tub use are beyond dispute and are even prescribed by doctors for the treatment of specific ailments. Conditions such as stress, arthritic pain, fibromyalgia, restless sleep, and type 2 diabetes, have all been treated with hydrotherapy. 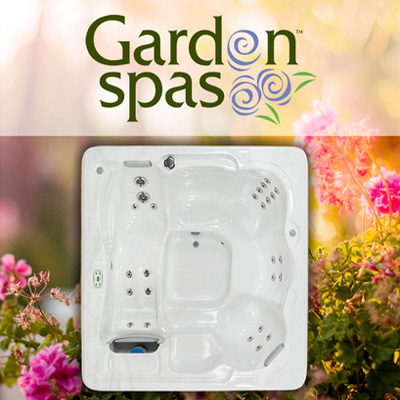 Garden Spas combine handcrafted artistry and ergonomic design to create the ultimate spa experience. 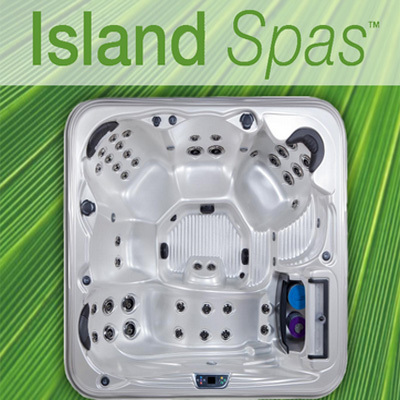 Garden Spas are small hot tubs designed especially for use in smaller homes and tight spaces, indoors and out. Garden Spas plug into a standard wall outlet, for an easy plug and play experience. 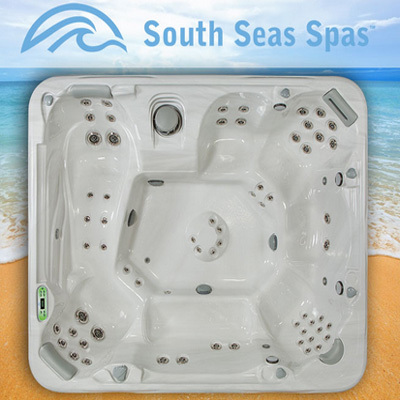 South Seas Spas combine handcrafted artistry and design to create the ultimate spa experience. They have been hand-sculptured with a contemporary, elegant design that adheres to the human body perfectly for maximum comfort. This spa line is built to deliver robust and meaningful hydrotherapy, performing consistently at the top of its class. What’s more, with the Island Class, each spa is uniquely crafted to meet your specific needs and cater to your demanding tastes, while always finding a way to accommodate your budget. 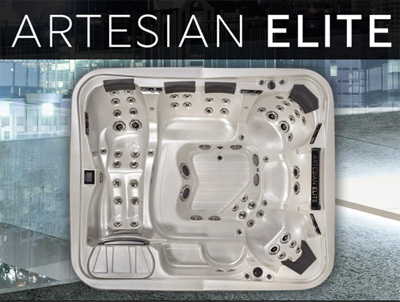 Artesian Elite Elite Uses DirectFlow Technology. The innovative patented DIRECTFLOW Personal Control®Switchless Motor and Direct Plumbing System combined with the VARIABLE FLOW CONTROL (VFC) provides each user the ultimate individual control and hydrotherapy experience. 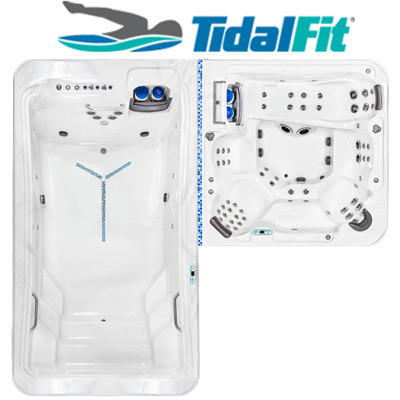 TidalFit pools are equipped with a commercially rated pumping system that produces a current of 400 gallons of water per minute. This pump system is equipped with adjustable swim jets and variable flow controls that allow users of all levels of fitness to swim at their own desired level of intensity. Resistance cords are used in the TidalFit pool to accomplish curls, tricep extensions, chest presses, shoulder pulls, and back pulls.